Congratulations to our member of the month, Adam Ritchie!!! Adam Adam has been training with us for about a year and a half now and has steadily made great progress. A former swimmer and current coach, his engine was already intact, but he has consistently followed the program and has made some serious progress with his strength gains and increased his capacity in workouts. It’s no surprise here that he led the gym in total PR’s among all men and women training, hitting 131 PR’s over the course of 2016. As with most members of the month, the key is consistency. Adam gets in regularly each week, hitting the strength work and pushing the intensity on each metcon. He regularly stays after class and does the prescribed accessory work to assist with his major lifts and puts in extra work on current weaknesses and things he wants to get better at. It has without a doubt helped him get where he is today. We love Adam’s presence in his usual 6 am class, he doesn’t make a lot of noise but quietly gets his work done and crushes metcons. He always sticks around to push the rest of the 6 am crew to finish out the daily WODs, and then continues with his normal extra work. We thank him for his positive attitude and for being an awesome part of our rise and grind crew! Below are a few fun facts about Adam. It has been 1.5 years. I used to make fun of Coach Jacquie for her “cheating” CrossFit pull-ups, but I came to Vae Victis with her and did Fran one day over the summer and was hooked ever since. I love that it pushes you to try things you never would. Hanstand walks and muscle-ups on rings are things that I never thought I could/would be doing. I love the coaches. I have had the opportunity to take class with all of them at this point and each person catches something different or explains things in a unique way. It always keeps me thinking about what I need to do better, and of course I love the people – 6 AM crew!! This is an impossible answer…just too many to list. Despite being a pretty good competitive swimmer, I couldn’t do 1 pull-up when I was in high school. Get back on the rings and improve my muscle-ups! Once again, congratulations go out to Adam for impressing all of us with his amazing personality and “never say die” attitude. 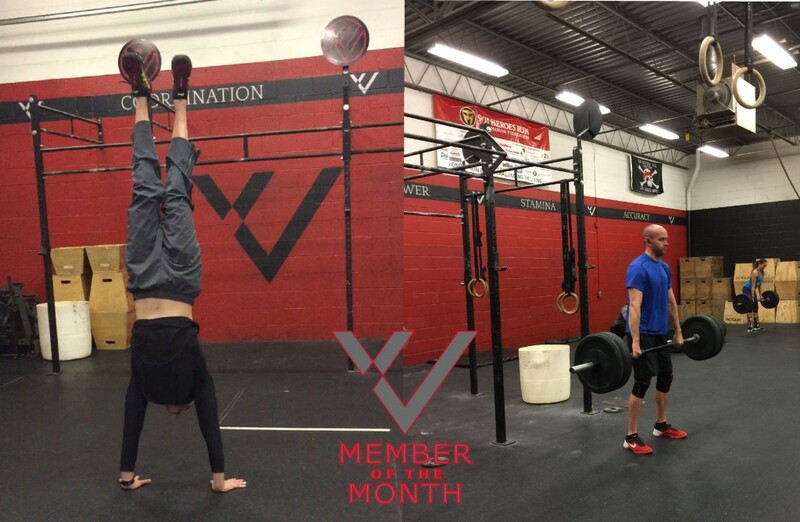 That is what it means to be the CrossFit Vae Victis Member of the Month. Check back next month for the next Member of the Month. We will once again be highlighting one of our great members that is killing it in the box.